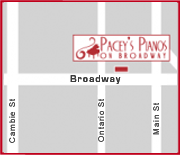 We can help guide you in deciding which piano to purchase. Japanese crafted-pianos are explained more in-depth. Music enhances an individual’s development for the better. If you’re interested in learning how to play the piano, please check out our information for it below. The piano, as with all other instruments, needs to be maintained in order to sound its finest. Research has shown there are many benefits of how playing the piano helps improve intelligence. We compare the differences between the Steinway and Mason & Hamlin models to make it easier to understand the differences. Guidelines are presented to suggest an optimal location for the placement of your piano. We discuss how piano sales work and what to look out for. Read the wonderful comments we have received! Thanks for all of the help Michael. Now I know why you have been in business for so long.